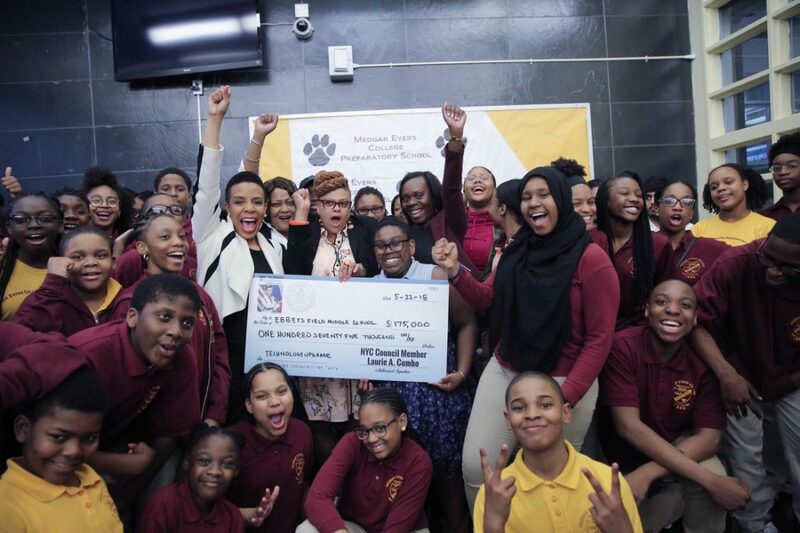 CROWN HEIGHTS – City Council Majority Leader Laurie Cumbo paid a visit to a Crown Heights high school to announce the winning projects from Participatory Budgeting Cycle 7 in her 35th District, unveiling the results and presenting oversized checks at Medgar Evers Prep on Tuesday, May 22. Installing new lighting, sound system, paint job, curtains, chairs and stage floor in the auditorium. The projects were selected based on the votes of 4,478 constituents in District 35. Of course, at the last census, roughly 86,000 people were eligible to vote on participatory budgeting in District 35, which means even though turnout was up, something around 5% of the eligible voters actually bothered. With $1,000,000 of funding on the line for each district, each vote in District 35 was essentially worth $223. Not bad for spending a little of your day all the polls! Get Out and Vote: Participatory Budgeting Vote Week Ends Sunday, April 15! The end of Participatory Budgeting Vote Week is almost here. The response so far has been great and there’s still a chance to vote. You can see where to vote and which projects are on the ballot by clicking here: https://on.nyc.gov/2G3qnPs. You can make sure you live in my district by clicking here: https://on.nyc.gov/2u5MCAS, and typing in your address. If you can’t make it to a poll site, you can vote on line by clicking here: https://bit.ly/2ICH4lC. Any resident of district 35 age 11 (or in the 6th grade) and older can vote – even if you’re not a registered voter. Don’t miss out on your opportunity to be among the legion of residents who want to have a say in making our community better. The deadline to submit your pre-K application is quickly approaching! Make sure you apply to free, full-day, high-quality pre-K by March 30, 2018! All NYC children born in 2014 who apply by the deadline are guaranteed a pre-K offer. All you need for the application is your child’s name and date of birth, your contact information, and your list of up to 12 pre-K programs. Use Pre-K Finder or the Pre-K Directory to choose programs and rank them in your true order of preference on the application. Remember, the application is not first come, first served, but the deadline is coming up fast! If you already submitted your application, you’re all set—but you can still make changes to it before the deadline, if you’d like. Call us at 718-935-2009 or visit Pre-K Admissions if you have any questions.